In Councillor John Keighley, the Stanningly Church possesses an able, painstaking, and industrious Society Steward. The material interests of the church receive careful and ?tting attention, and this, not at the expense of the spiritual, for our brother is ever to the fore in the Sunday-night prayer meeting and in all the religious activity of the church. Mr. Keighley knows the work of his position, for this is the third time he has held the office. His membership extends to over thirty years, and his official life almost as long. He has been Sunday-school teacher and Superintendent, and has held the position of School Secretary for over ten years. He has also been Assistant Class Leader, Secretary for the Trust, and Circuit Steward, and has represented his Circuit in the District Meeting. Mr. Keighley’s influence, however is wider than his church. He has been President of the Local Free Church Council, and is frequently in demand for addressing adult classes in all the churches on Sunday afternoons. For his daily work he holds a secretaryship where the election is by popular vote and the chief qualifications are trustworthiness and stability. The neighbourhood knows his worth, for he is the consultant and adviser in very many homes. He is a useful member of the Borough Council, rendering excellent service on the educational and other committees. Recently the development and enterprise of our church has made the work of the Society Steward unusually exacting, but our brother has fully met the demands, and rendered excellent service. We trust his best days, however, are yet to be. 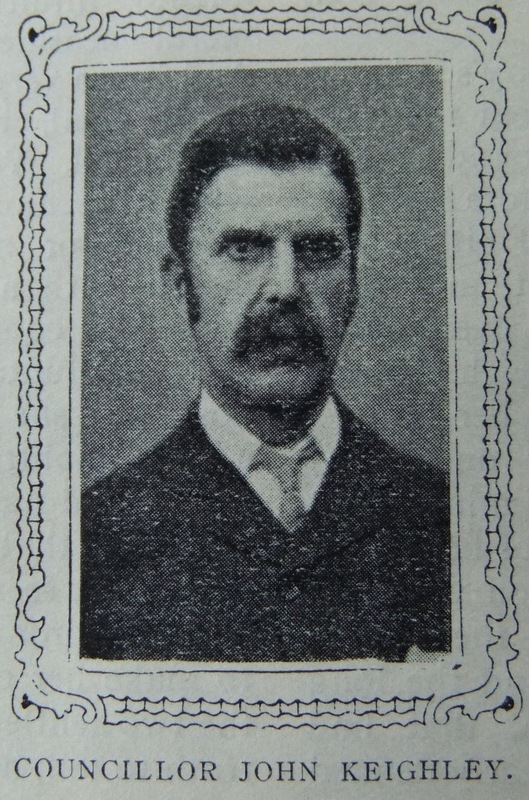 John was born in 1862 at Pudsey, Yorkshire, to parents Benjamin and Elizabeth. Benjamin was a plasterer. John was baptised on 4 October 1868 at St Paul, Pudsey, with two siblings. John worked initially as a wool sorter. By the time of the 1901 census he had commenced working for the Coal Society and the 1911 census records him as Secretary of the Coal Society. His daughter Louie’s wedding record describes John as a limited company secretary and Alderman. John married Clara Holmes (1864-1944) on 27 August 1887 at St Mary, Calverley, Yorkshire. Census returns identify nine children. John died on 23 February 1934 at Pudsey, Yorkshire.